East of the Cemetary. To enter this fountain, you must cut down a bush to reveal the hole that is displayed in the image. Fall into the hole and meet the faerie. The cave above the hole is the exit. To the right of the entrance into the Eastern Palace area of the Eastern Hills. To the right when you enter the north end of the Swamp. Bomb the loose rock out of the way to reveal this hole. Desert of Mystery Entrance (area between the Desert and the Swamp). 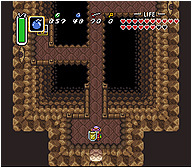 In the room with the Big Chest, go up the stairs as seen in the picture and fall off the ledge into one of the side pots. In the room on the west side of the dungeon with the exit to the ledge that gets you to the back part of the dungeon. Push the third block from the left wall up and it will open the door. 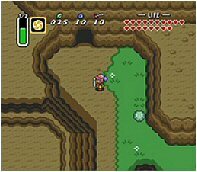 In the Pond of Happiness located in South Lake Hylia. Bomb the right wall to open this door way. #5 of the Flute drops you here. It is located at the south-eastern end of the Eastern Palace area, down one screen. 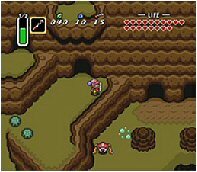 One screen to the left of Link's house. Dash into a pile of rocks to reveal this stairway. On top of Death Mountain in what is known as Spectacle Rock. Enter here and fall into the hole to reach the fountain. In the South-West section of Death Moun-tain (reached by crossing a bridge.) 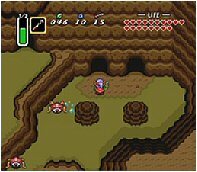 In this cave that Link is standing in front of. Go up the stiars inside and there will be a hole at the right all alone. Fall into that hole and there will be two faeries. *Can also be reached another way. Check below in Dark World Faerie Fountains under Dungeon Faerie Fountains (Turtle Rock). 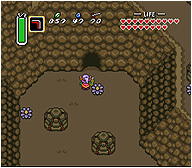 In this left cave in the South-West section of Death Mountain. Enter and use the hookshot on a pot inside to get across to the fountain. 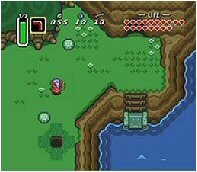 At the end of Lake Hylia where you also get the Ice Rod. Enter this cave and bomb the wall inside. On top of Death Mountain, to the left of the Tower of Hera. Dash into this pile of rocks to produce a single faerie. At the Lumberjack's house at the Death Mountain Foothills. The Lumberjacks will be cutting on this until you defeat Agahnim for the first time. 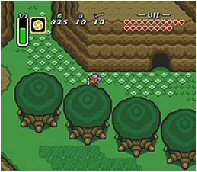 Then dash into the tree to get to a fairy fountain (as well as a Heart Piece). 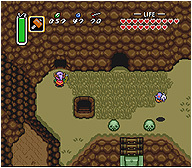 Located at the very end of the Dark River, east of Ice Lake Cavern. 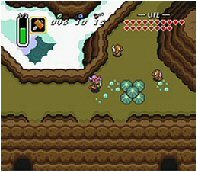 Get there by making your way to where the Ice Lake Cavern is located and head down and enter a new screen to the right. Find a dock and get out of the water and head up to the north. 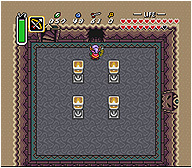 You will need bombs to open up the cave. 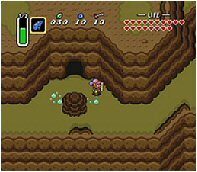 For more reference to this place's location, it's Light World comparison is the cave from which you receive the Ice Rod. Not so ironic that this cave would house the same thing its Light World comparison does. 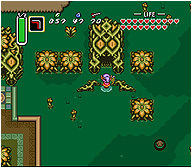 It can be located to the right outside of the Palace of Darkness area, known as the Eastern Brush. To the right of the Misery Mire dungeon is this "house". 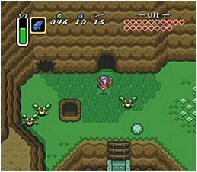 On your first trip to Death Mountain, when you step into the portal, go as far south down the mountain as you possibly can and head to the left and you will find this cave. Convenient especially after attempting to retreive the Staff of Byrna. 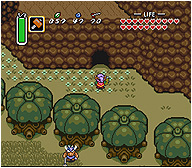 Enter this underground passage located under a rock to the left of Turtle Rock dungeon. Inside, cross the invisible bridge and go into the next cavern. 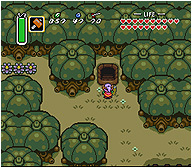 The next door up leads into a cavern with the Great Fairy. When you enter the Palace of Darkness, take the door to the right and follow the series of rooms that follows. Eventually you will end up in this room on this ledge. Use a bomb on the wall to the right and you will find a Faerie Fountain. 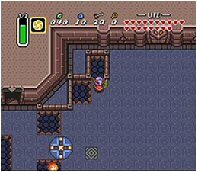 In the Ice Lake Cavern, once you have finally found the Big Key and opened the door with the Big Key symbol, you will enter into this room, and will be close to reaching the Boss room. As you can see in the picture, if you have the blue blocks down you will be able to fall into either of the two pits. Both will bring you tumbling into a pot below which hides a Faerie Fountain. *Mentioned above in the Light World Fountains. After passing out of the "dark room" in which you had to guide the Somaria platfrom to a button and then finally the opened door, go two rooms down and cross this bridge. You will make it to this wall where you can bomb a hole in it as depicted. Step outside and you will be on a ledge. Warp and you will be can step into a cave which leads down some stairs to a room with two fairies. 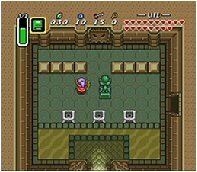 On the lower levels of the Tower of Ganon, after you have defeated the Armos Statues and have received the Big Key from the north room, go into the left and you will be here. Bomb the north wall to make this doorway and inside you will find four fairies. Careful since there is a pit in that room. 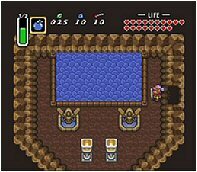 In case the last Great Faerie Fountain listed above was not enough, or you need to refill your bottles in preparation for the Tower of Ganon, instead of going up into the Great Fairies' room, take a right and you will be in this hall. 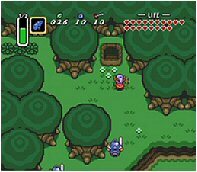 Bomb the north wall and it will create the door that Link is facing in the picture. Inside you will find a Faerie Fountain. Another that is similar to its Light World comparison. 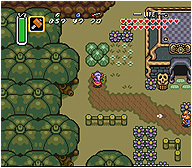 This one is located to the left of the Bomb Shop, which would be Link's House in the Light World, and positioned in the far back. Dash into the rocks to break open the entrance. Ok, so it's not a "fountain" but if you dash into this pile of rocks that is found to the left of the Fortune Teller's two faeries will come flying out. Useful if you are working on the Skull Forest or Blind's Hideout dungeons.